Certain animals have done immense damage to the native New Zealand bush. Some, like rats, were stowaways on canoes or ships. But some were introduced on purpose – possums, stoats, deer and goats are among those which were brought over to solve one problem, but created another. Before people arrived in New Zealand, the land was covered in bush. But three-quarters of it has been burned or cut down. People also brought with them animals which ate the bush and its native birds, bats, lizards and insects. Possums were introduced from Australia in the mid-1800s to be used for fur. Millions of them now live on farmland and in forest throughout New Zealand. They kill trees by stripping them of leaves, fruit and seeds. When larger trees are gone, scrub takes over, and many native animals can no longer find food and shelter. Traps, poison and guns are used to control possums. 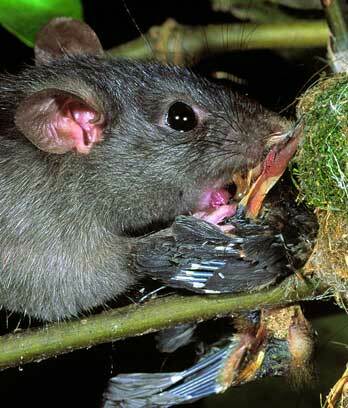 It is thought that Pacific rats (also known as kiore) came with the first Polynesian settlers, about 1250–1300. Ship rats and Norway rats arrived with the first Europeans and quickly spread. Rats have killed off some native species of birds and bats. In winter they eat insects that would otherwise be food for native animals. Mice also take the food eaten by native animals. Mice live in swarms in bush throughout the country. Stoats were brought from Britain in the 1870s to control rabbits. They spread to the bush, where they took eggs from nests and killed young native birds. Cats were carried on ships to control the rats on board. They first came to New Zealand on Captain James Cook’s ship, and later with whalers and sealers. Wild cats prey on birds, lizards and insects, and are hard to control. Deer, goats and pigs also damage the bush and its wildlife. Deer were introduced from 1851 to provide game for hunters, but ate a lot of the forests. Early farmers used goats to control blackberry and gorse, but some goats became wild and started to eat out the bush. Wild pigs, introduced by Captain James Cook, dig up the ground when looking for roots and other food.